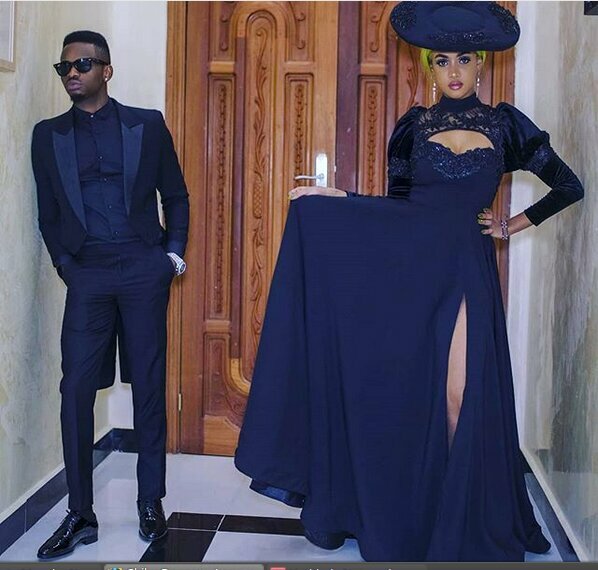 Diamond Platnumz and his Kenyan girlfriend Tanasha Donna have started wearing matching outfits. The young lovebirds are set to walk down the aisle soon. They were to wed on Valentine’s day but they rescheduled their grand wedding ceremony because Tanasha’s mum wouldn’t be available on the said date. I’m a gangster in a dress 🎱🎩 Inspired by @iamcardib. Diamond’s caption left many confused about what he meant with a section of his fans speculating that he was ‘rehearsing’ for the black rose Valentine’s, which Zari sent him last after the very public break up. jelitha.johansen: Tu hata hamujapendeza nenda mkazike huko na huyo Tanasha huo ungo vipi. thesabahati: Ulipo nipo ila Zari hakuna tena kama yeye. I respect your decision and I want to see you happy. salt en sugar: Two village rats when they meet this is what happens now. Waris did? Chidi Platnumz: Mnaenda kumzika nani sasa? Seenhia: Why you both look like Offset and Cardi? faiza__beee: You guys look like the cheap version of Offset and Cardi B! Stop copying stupid! fay_wein: Naomba kuzikwa na picha ya @zarithebosslady. Mgebela: Kweli bi harusi kajitwisha ungo. Jackbudodi: Kwani kulikuwa na ulazima gani wa kuvaa huo ungo kichwani.